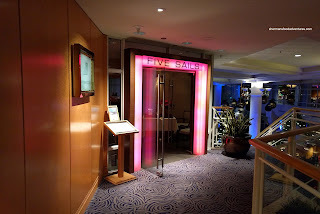 For a restaurant that has been around since the Pan Pacific opened in the 80's, it is a bit strange that I've never eaten at Five Sails. I've been close though, since The Prow (formerly located within Canada Place) was one of my go to restaurants when it was still open. Heck, we've been to the brunch buffet at Cafe Pacific (now Ocean 999) 3 times in the past 7 years (kinda pricey, can't go all the time!). Finally, it was about time we sampled the finely-crafted and generally traditional menu at Five Sails. Before we got to our appies, we were presented with an Amuse Bouche consisting of a Squash Soup and Foie Pate. This was a pretty substantial portion for an amuse, but hey, we weren't complaining. 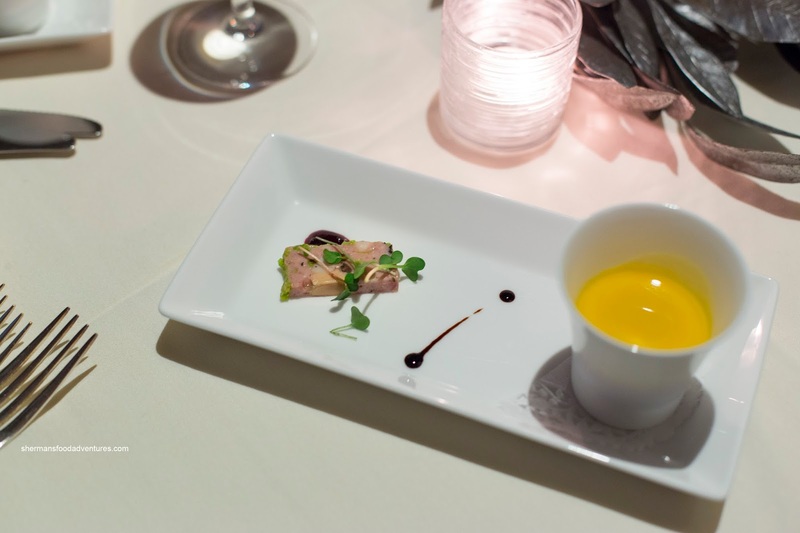 The piece of pate was meaty and mild-tasting while the star of the show was the creamy and full-of-depth squash soup. It was served steaming hot which helped highlight the natural sweetness of the well-seasoned squash. Onto our appies, the best of the bunch was the Ahi Tuna Tartare atop avocado and crispy wonton strips. The buttery tuna was fresh and nicely seasoned with just the right amount of sesame oil. I thought the ginger in the dressing was properly restrained where we could taste it, but it didn't overwhelm. 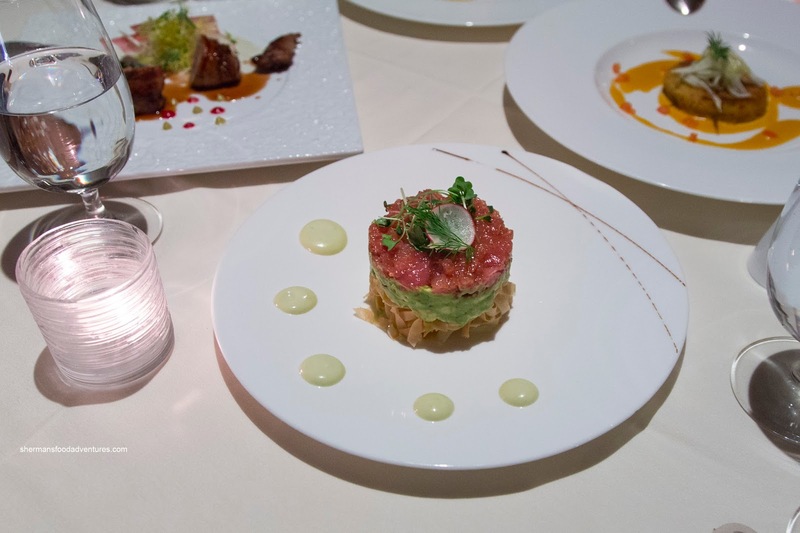 The tuna melded well with the creamy avocado while the wonton strips provided the crunch to break up the soft textures. 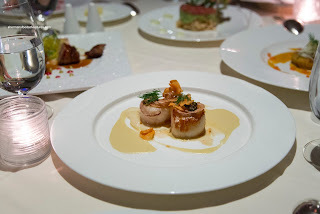 Just as tasty and well-prepared as the tartare was the Caramelized Weathervane Scallops. These large scallops were buttery and almost juicy with a smoky sweet sear on the outside. They were well-seasoned with a smooth and flavourful sun choke puree and crispy shallots and capers as well as an impactful double-smoked bacon emulsion. We got an off-menu item which was one of the featured appetizers for the day. 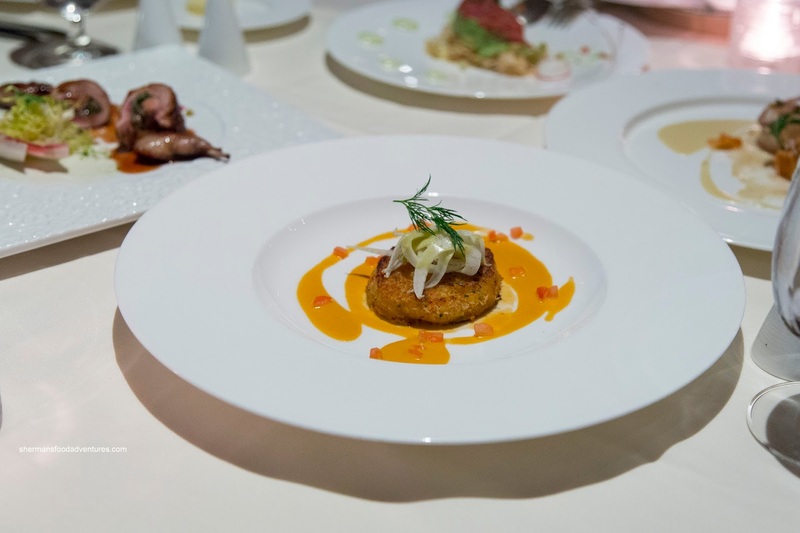 It happened to be the Crab Cake with fennel and lobster foam. This was my least favourite as the texture of the crab filling was dense and somewhat mealy. If we focused purely on the crab itself, it was moist and still fluffy. Something about the mix of ingredients that didn't work texturally. On the other hand, the exterior was on point being crispy and not greasy. Moving away for seafood, we had the Pan-Seared Quail wrapped in pancetta and stuffed with foie gras. I thought the skin was nicely rendered and crispy while the meat was fairly moist. The dijon and sherry vinaigrette was lightly acidic and tart which lightened things up. For my main, I went with the Honey Glazed Smoked Duck Breast which was prepared somewhere between medium and medium-rare. Hence, the meat was tender and moist whereas the skin was partially rendered. It was lightly smoky and only mildly sweet. 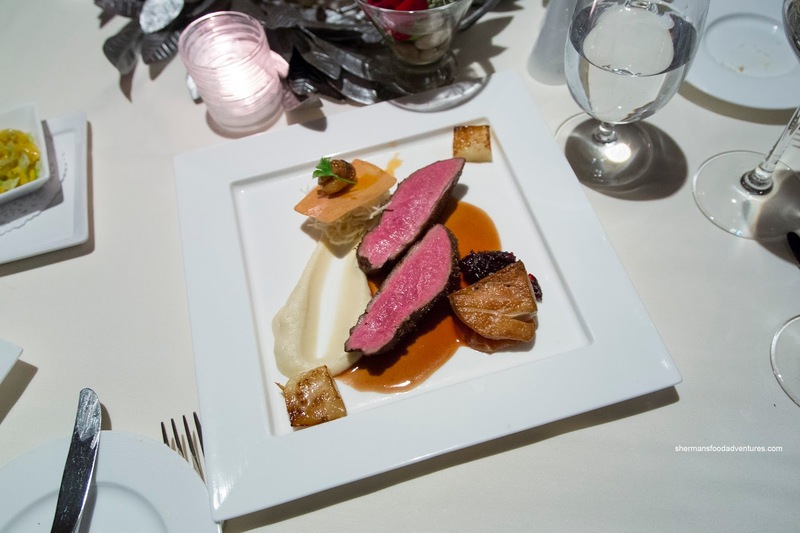 I thought the port wine sauce provided a level of depth and background sweetness. 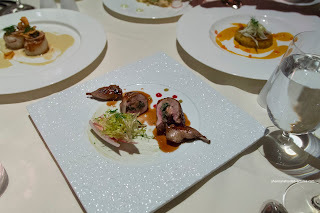 The slice of seared foie was decadent which was nicely accented by the sweet quince puree as well as the tart cabbage. The side of spatzle was really good as it was tender and buttery with a mild chewiness. Being the meat eater that he is, my son had the Seared Filet of AAA Alberta Beef on a bed of sauteed soft spinach and well-seared wild mushrooms. 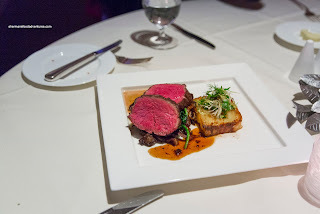 As evidenced in the picture, the beef was a perfect medium-rare and well-rested. 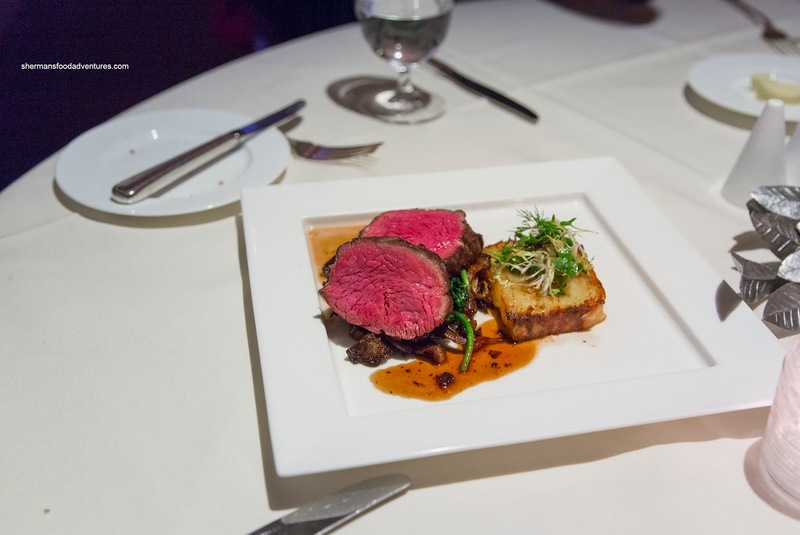 It was super tender where the truffle sauce added the necessary Earthy flavours for the mild-tasting filet. 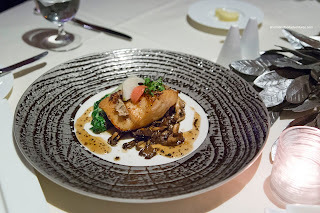 My daughter decided on the Oven Roasted Sable Fish prepared with a classic miso-sake marinade. The timing of the marinade was perfect as the flavours had penetrated through while not compromising the texture of the fish. It was flaky and buttery with an aggressive caramelization of the surface areas. Hence, the sweet and salty flavours really came through with every bite. The wild mushroom emulsion underneath was a touch greasy, but it helped add a different taste to the sweet fish. I thought the pickled radishes were a nice touch adding both a crunch and acidity to the dish. My dad had Pan-Seared Sea Bass with citrus featuring shaved fennel, sautéed fingerling potatoes, fresh citrus segments, orange paste & orange emulsion. This was a visually attractive dish where it ate as good as it appeared. 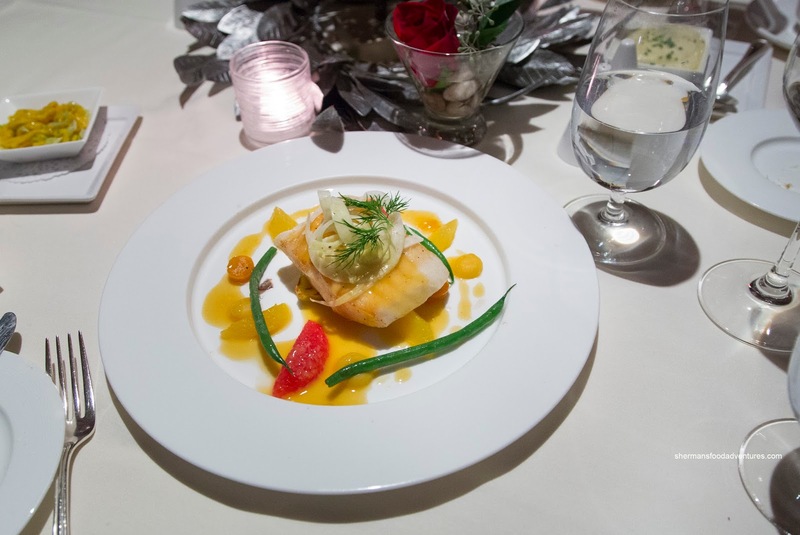 The fish was flaky and nicely bright due to the different methods of citrus on the plate. Viv continued with the seafood theme with the Catch! sporting wild gulf prawns, caramelized Weathervane scallop, sea bass, cauliflower; timbale, roasted & pickled lemongrass sauce perfumed with coconut milk, hint of chili. Again, all of the seafood was on point including meaty albeit salty prawns, buttery scallop and flaky sea bass. 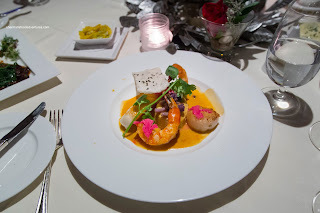 The lemongrass sauce was aromatic and rich with flavours that were almost lobster-like. Interestingly, this was a bounty of the dish and was less pricey than the aforementioned fish dishes. 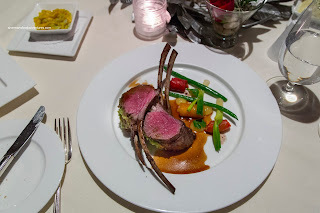 My mom went for her standby being the Rack of Lamb encrusted with fresh herbs and pine nuts. This meant the lamb itself was rather flavourful on its own without being salty. It was mostly medium-rare which meant it was juicy and tender. The side of goat cheese infused whipped potatoes was well-seasoned and rich. 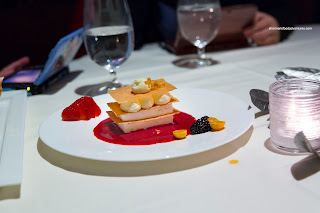 For dessert, we shared the Luxe Lemon Mille Feuille which was texturally a delight featuring super crunchy and sweet layers of phyllo in between chilled lemon cream and parfait. I thought the temperature was just right as the lemon cream was firm and thick. Although the dessert was sweet, it did not eat as such due to the good amount of tang from the lemon and fresh berry puree. My son attacked the Chocolate Opera Slice and I had to wrestled a taste from him. It was purposefully sweet while not too heavy, although it was still chocolately rich and silky. On the side, the smooth salted caramel ice cream was a nice treat on its own. 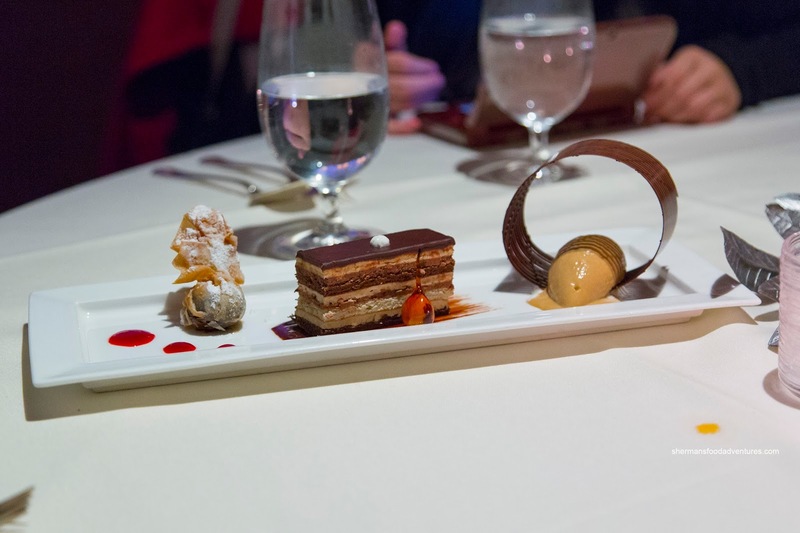 These 2 desserts were expertly and carefully prepared, much like the rest of the dishes. I can see why Five Sails has lasted so long despite the barage of new sexier restaurants. They keep to what they are good at and do it well while located in a killer location at the Pan Pacific.